O'Carroll Guest House auf dem Yellowstone verfügt über 3 Schlafzimmer, 2 Bäder, eine voll ausgestattete Küche mit Geschirrspüler, Herd, Mikrowelle und alle Kochgeschirr, Waschmaschine, Sat-TV, Wi-Fi und ein geräumiges Esszimmer und ein Wohnzimmer. Zwei Schlafzimmer haben Doppelbetten und das dritte zwei Einzelbetten. Zusätzliche Klappbetten sind bei Bedarf für einen 7. und 8. Gast verfügbar (Gebühr). Das Gästehaus ist nicht klimatisiert. Jedes Zimmer hat eine Decke und zusätzliche Lüfter. Bitte beachten Sie, dass der Preis pro Nacht $ 220 für einen Aufenthalt von weniger als 7 Nächte. Es gibt zusätzliche Gebühren für mehr als 6 Personen. Bitte kontaktieren Sie den Vermieter für Details, wenn nötig. 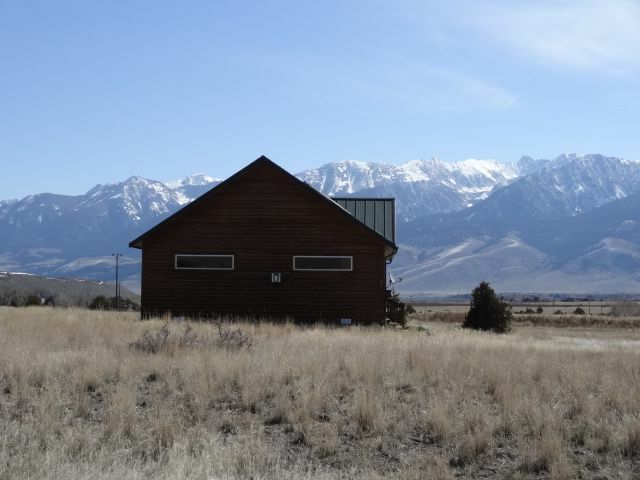 O'Carroll Guest House befindet sich im Herzen von Paradise Valley mit dem Absaroka Mountain Range im Osten und der Gallatin Gebirge im Westen entfernt. Günstig gelegen, nur 35 Meilen von der Nordeinfahrt in den Yellowstone National Park und Gardiner, Montana, ist dieses Haus der perfekte Ort für Tagesausflüge in und aus dem Park. Es blickt auf den Yellowstone River, der durch das Tal fließt, und ist für Weltklasse-Fliegenfischen im Fluss und in der Nähe von Bächen Frühjahr festgestellt. Das Tal hat mehrere natürliche heiße Quellen, einschließlich Chico Hot Springs nur sieben Meilen entfernt. Chico bietet Live-Unterhaltung jeden Freitag Abend, Outdoor-Abenteuer, außergewöhnliche Restaurants und natürlichen heißen Quellen Pools. Zusätzlich zum Yellowstone National Park, die Möglichkeiten für Sightseeing, Jagen, Fischen, Hundeschlitten, Langlaufen, Skifahren, Wandern, Reiten, Vogelbeobachtung, Kajak fahren, canoeing- (die Liste geht weiter und weiter) gibt es zuhauf im Tal und viele andere weltbekannte Erholungsgebiete sind nur einen Tagesausflug entfernt. Es ist ein Haustier (Hunde, nur - keine Katzen, bitte) Kaution, die zu 100% zurückerstattet, wenn vier Regeln befolgt werden. Erstens: Hunde aus Polstermöbel und Bettdecken. Zweitens: Hunde sind nicht allein im Gasthaus verlassen, es sei denn in einem Zwinger. Drittens: Keine Schäden an der Kabine oder Einrichtung, die eine spezielle Reparatur oder Reinigung erfordert. Anstelle der tatsächlichen und Übertragung von Mitteln (150 $. 00), ist es in Ordnung für die Gäste bei der Ankunft Kreditkartendaten und die Genehmigung für ein $ 150 zur Verfügung zu stellen. 00, wenn es sein muss. Viertens: Bitte informieren Sie die Eigentümer wissen, wenn Sie Ihren Hund mitbringen möchten. Die Badezimmer sind mit allen Bettwäsche und Annehmlichkeiten. O'Carroll Guest House ist in einem Haus mit O'Carroll B & B. Das Frühstück im B & B kann gegen Aufpreis mit Vorbehalten versehen werden. Fragen Sie den Vermieter für Details. Our family of 7 (2 adults, 5 kids) traveled from California to spend Christmas in Montana/Yellowstone. We originally booked a different house through VRBO, but upon arrival the first night, we found the place to be so dirty that we couldn't stay there. We were in panic mode...how could we tell our 5 kids that Christmas would be spent in a hotel??!! The next day I found O'Carroll's Guest House on VRBO and sent a message to the owner with our plight. Eleanor called me within 20 minutes!! It was two days before Christmas and she was willing to get the house ready for us. What an absolute miracle to find an available house at the last minute and an owner so kind and understanding to our situation. Eleanor was the absolute best! She even brought us a Christmas tree and decorations for the kids to hang. The house was spotlessly clean! The house was warm and cozy! The kitchen had every thing I needed to cook Christmas dinner! The location was perfect with gorgeous views. Yellowstone in the winter took our breath away. We saw gray wolves, black wolves, elk, bison, bald eagles, moose and bighorn sheep. What could have turned out bad, turned out so wonderful and so many great memories were made. I can't say enough positive things about Eleanor and her guest house. Next time we come to Yellowstone, we will stay in her guest house again! Thank you Deanna. I thoroughly enjoyed the entire family being here. I usually travel at this time of year and am so glad I decided to stay here so that I could host your wonderful famiIy. I hope your next visit is very soon! I now want a German pointer! Pictures Don't Do It Justice-A Treasure! Although the property is nice, we had an absolutely horrendous experience with the owner. We should have been more mistrustful, in retrospect there were signs. When we arrived the owner did not answer the phone while we were waiting in front of the property. After a while the owner did take the phone and say "stop calling me" then hung up. We eventually resolved to go to the owner house and knock on the door, where she indicated to go directly in the guest house, no walk-in necessary (another red flag ...). The stay was globally correct, however a number of small things are broken / damaged, but nothing major, as you would expect in any habitation (one of the toilet was hard to flush and had to be flush twice, one of the fan chain was missing ...). We did not really pay attention to this until after the stay. We had to leave in the morning at 5 to catch an early flight so cleaned the whole house the evening before. After getting home, we were astonished to see a claim for damages for $60, for excessive cleaning required (10 hours) and multiple broken items (toilet clogged and tinkered with, fan chain broken). I think that will teach us to trust owners and proceed without walk-in/walk-out. Long story short, Montana, Paradise Valley and Yellowstone park are incredibly beautiful. If you want a chance to visit them and get your vacation spoiled by false claims, this property is a good choice. In my 20 plus years of business, I have never received a bad review but also, I have never felt compelled to not totally refund the total damage deposit. This was due to the difficulties my crew and I had with cleaning the guest house. There were no charges for damage. I am sorry for any problems the guest had and wish he had informed me at the time. I am equally frustrated as he with the lack of communication and do apologize for my part in it. The house was perfect for our vacation! The house is very well kept with beautiful views. The kitchen has everything we needed to make nice meals. It is close to the road, but we hardly noticed traffic. I would absolutely stay here again! A perfect location and house to see the Bozeman/Livingston area and Yellowstone. We had a marvelous time staying here. The location was perfect and the house had everything we needed and more. Eleanor, our host is an amazing lady and booking, staying, leaving was all super easy. The place is quite new and only a few had stayed before us. Very, very highly recommended. Wish we could have stayed longer! Drove from S Carolina with our Ohio teenage grandchildren to spend time with our Montana son...absolutely perfect location! Morning coffee and evening drinks on the front porch...even during the rain was so relaxing! Eleanor goes above and beyond in providing all of the comforts you could ask for! Can’t think of anything missing! We were all very comfortable! Close to Yellowstone, easy to go back and forth. Not too touristy! I appreciate your kind review. You are welcome to return any time! Livingston, MT (18 Meilen nördlich) beherbergt das größte Rodeo im Bereich 2-04 JULI jedes Jahr. Es gibt auch eine jährliche Musikfestival und Geigern "Picknick am Wochenende jeden Sommer eine jährliche Barke im Park Veranstaltung einer Messe und der Technik zeigt, in Hülle und Fülle.